A Great Way to See Our "Venice of the North"
Getting around St Petersburg by boat is definitely one of the best ways to enjoy a romantic sightseeing trip in the city of rivers and canals and travel around faster. Built on the water, on numerous islands, the city of St Petersburg is very famous for its graceful canals and bridges, that's why it's also known as the "Venice of the North". With more than 70 rivers and canals winding their way through the city and more than 400 elegant bridges crossing them, a trip on a boat is really a must. Several boats running across the rivers and canals of St Petersburg Russia. Getting around St Petersburg by boat or taking a river cruise along the famous Neva River is a wonderful experience that will last forever in your memory. By water you will get a different view of the city and its stunning neo-classical architecture, enjoy fresh air and the reflections of water during the day, including its spectacular drawbridges at night. For your information, there are various forms of water transportation in the city to choose from to travel around faster (Aquabus, Hydrofoil, Boat, Ship). All of them have emerged over the years to facilitate the daily life of many Russians, but then some of them became also an interesting means of transport for foreigners for exploring the city of the Tsars differently. Today, for most residents, travelling in St Petersburg by boat is in fact an alternative way to avoid the daily traffic and the rush hour of the crowded metro, while for you, it can be an unforgettable experience. To get started click on the topic below to fast track to that section. So, anyone who arrives in the Sea Capital of Russia from June to September, can enjoy the beautiful city’s views and famous sights by using several types of water transport. In fact, if you travel in St Petersburg by boat during this time you can see the grandeur of the waterways, the historical palaces and parks on the banks of the Neva, enjoy the famous drawbridges at night and much more – all visible from a long way off. 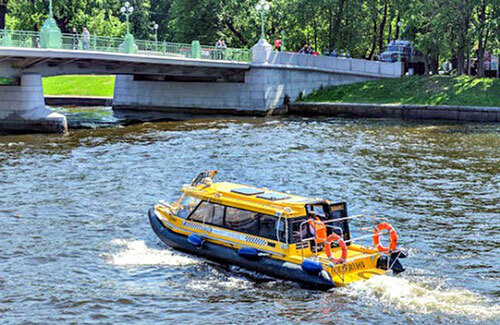 However before you jump in to one of these three water transports, you should know that the new entry water taxi is a public transport used mostly by commuters that has set specific routes across the Neva River, even though anyone can take it. The boat tour and hydrofoil are run privately and aimed mainly at visitors. So your best choice! For example, if you take the hydrofoil, you will get to Peterhof by sea, while if you take a boat tour, you will sail across the famous rivers and canals of St Petersburg and enjoy a scenic city trip on the water. The water taxi known as Aquabus is mainly used by local commuters for daily travel in the city. Basically, you have more than 20 yellow Aquabuses ready to take you along some of the famous sights of the large Neva River and the amazing bay of the Gulf of Finland. This public water taxi can be your cheapest option if you're on a low budget travel and you don't want to miss a ride on the water. Aquabus running on the Neva River in St Petersburg, Russia - Source Wikimedia. To catch one of them it's very easy! You will recognize the Aquabus by their distinctive yellow roofs installed across the city river, from where you will buy also your ticket. No worries! Now all information is in English too - but you will not find any live commentary on board as in the private boat tours, plus you won't cover all the main St Petersburg attractions, but just a few. So as I said early, this won't be your best option for touring the city! Tickets can cost 100 rubles (€1.60/$3.50) per trip, with tickets for children aged five to 10 and for large items of luggage costing 50 rubles (€1.0/US$1.80). Children under five travel for free. However, if you take the water taxi that goes to the town of Kronshtadt (located on the island of Kotlin in the Gulf of Finland - Kronshtadt line) remember that the ticket will cost you a bit more. The further you go, the more you pay. Simple! According to their specific route each boat can carry up to 35-12 passengers, (though the boat to Kronshtadt will be larger - 70 seats) and can reach a speed of 60 kilometers per hour. Generally the boats operate from June to September, every 10 to 15 minutes, each day of the week, from 8 a.m. to 8 p.m. Please see below the routes. “Central line” from Universititetskaya Embankment to Sinopskaya Embankment. "Nevskaya line” from Sverdlovskaya Embankment to Rybatskiy Pr. “Primorskaya line” from Arsenal’naya Embankment to Primorskiy Pr. “Kronshtadt line” from Arsenal’naya Embankment to Kronshtadt. 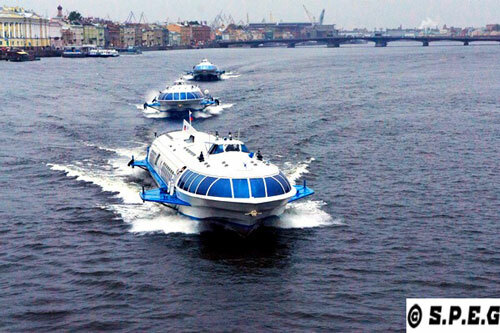 Known as Meteor, the Hydrofoil is used both by locals and tourists to go to Peterhof only. If you are thinking about visiting the pearl necklace of the Northern capital and you want to make a short trip outside St Petersburg by boat, then why not try the hydrofoil. The hydrofoil is the fastest and most comfortable way to go to Peterhof, even though is not the cheapest option. A one-way ticke tcosts about 700 rubles (€12/US$13), while a round-trip costs 1200 rubles (€20/US$22), and doesn't include the entrance to the park. Hydrofoils running on the Neva River in St Petersburg Russia. You will leave and buy your ticket from small landing stages on the River Neva near the Hermitage or in front of Admiralty. However, if you decide to buy tickets somewhere else, for example from us, you will pay a little bit more, but in return you will get your tickets delivered to your hotel or sent to you by email, plus you'll skip the line at the ticket office. For your information, the average time to get to Peterhof by hydrofoil is no more than 40 minutes. You will arrive directly at the Lower Park where the fountains are situated. Then, to go back, you will leave also from here. The hydrofoil runs on a daily basis and operates only during the summer. Boat tours are very popular across visitors who want to sail along the rivers and canals of the imperial city. 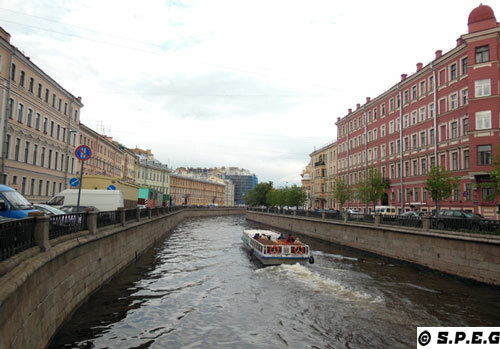 There are many St Petersburg Tours in the city, and the boat tour is for sure a "must-try". Because by taking a boat tour you will get magnificent city views from the water. You will navigate throughout interesting tourist routes on rivers and canals, and you will see historical palaces that the Aquabus does not cover. Moreover, if you take the midnight boat tour you will enjoy the picturesque scenery of Saint Petersburg at night, its warm lights and famous drawbridges. A river boat tour along the Neva in St Petersburg Russia. 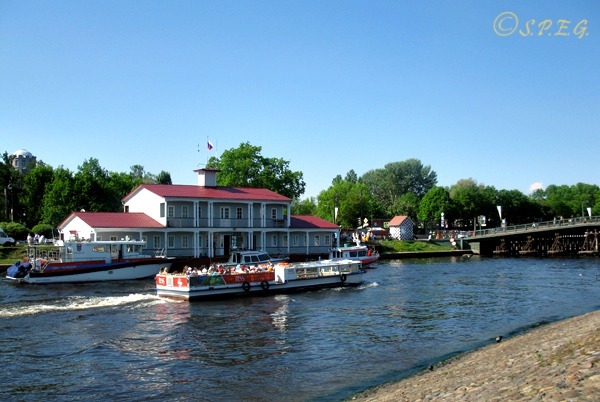 That said, you will find numerous boat tours on Fontanka River, Moyka River and Griboedov Canal. Some boats will be larger, others will be smaller. Some will offer a live commentary in different languages, others only in Russian. The choice is pretty wide, but only yours! Usually travelling in St Petersburg by boat costs from 600 to 800 rubles (€13.00/US$15.00), but the price can vary - it depends on the place where you take the boat, the tour company you choose, and the time chosen to ride a boat (for example, an excursion at night is more expensive). You will see the boats spread out near several bridges of the city rivers and canals. To spot one, you should just walk up and down along the famous Nevsky Prospekt and look for their boat stops. Getting around St petersburg by boat is really one of the best ways to do sightseeing in the city - but above all, is the way to go if you want to make your visit in the Venice of the North fascinating and memorable. We recommend you to take one of these boat tours on the cross of Fontanka River and Nevsky Prospekt or near the famous Saviour on the Spilled Blood Church. We've tried them and it was perfect. We've travelled St Petersburg by boat on different occasions, and it is something that you should not miss. We're sure you will like it as much as we did!